Going vegan; a lifestyle that raises curiosity and questions. With numerous cookbooks and celebs, more people than ever are wondering what’s so great about being vegan. No stranger to food politics, Oprah has championed for food awareness ever since she famously fought a lawsuit brought on by Texas cattle ranchers after forgoing beef on her show due to mad cow disease. Two years ago, Oprah underwent a 21-day vegan cleanse. And last year, she aired an episode revolving around food. 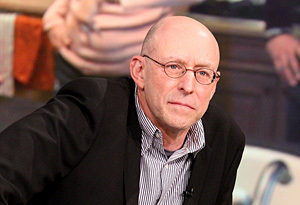 Journalist and food author Michael Pollan (Botany of Desire, Omnivore’s Dilemma) talked about the food industry, actor Alicia Silverstone talked about her journey to veganism and what’s on her grocery list and clips played from the documentary Food Inc. 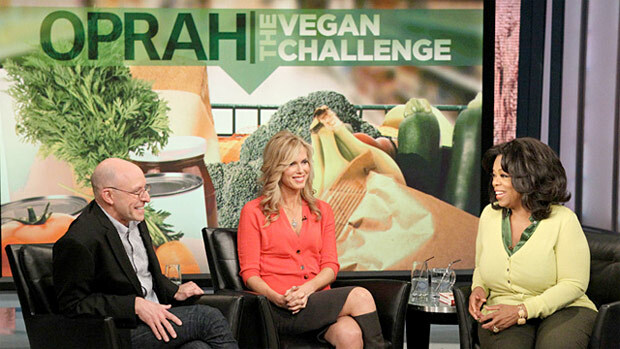 So when I heard Oprah challenged her staff and herself to go vegan for a week, I knew I had to tune in. Oprah and 378 of her staff signed up to go vegan, to not eat any meat, seafood or dairy for seven days. Yesterday’s episode chronicled the week-long challenge. Michael Pollan and vegan author Kathy Freston (Quantum Wellness, Veganist) went on the show to discuss the food industry and a vegan diet. Journalist Lisa Ling also filmed a segment at a slaughterhouse to show viewers how beef is made. Author Jonathan Safran Foer discusses the issue of meat as tradition in-depth in his provocative book Eating Animals. Americans consume 10 billion animals a year. Pollan, who investigated the factory farms and slaughterhouses, still eats meat a couple of times a week. Yet his research irrevocably altered his diet. Now he carefully selects his meat, eschewing “feedlot” or “industrial” meat. Pollan believes that if you’re not willing to see or think about where your food comes from, you shouldn’t eat it. 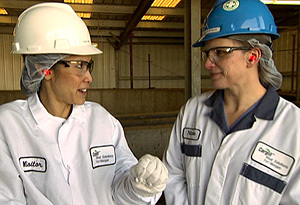 Lisa Ling went to Timmerman Feeding Corp. in Colorado, a feedlot for cattle who will soon be sent to a slaughterhouse. Then she visited Cargill, a slaughterhouse. Nicole Johnson-Hoffman, General Manager Cargill’s Fort Morgan Plant, was on the Oprah Show saying she was happy to have Ling there to “demystify” the food process. Not surprisingly, they don’t show the entire process since the crew are not allowed to film the kill floor (where the animals are killed). On the kill floor, a person (called the “knocker”) shoots a bolt into a cow’s head, in theory rendering them brain-dead. The problem? The bolt doesn’t always kill the animals or even make them unconscious. The video crew did film the skin, head and hoof removal. Due to her affiliation with the Oprah Show, Ling was able to obtain access. But very few people, aside from Ling, Pollan and author Safran Foer, have been allowed access to a slaughterhouse. Factory farms don’t have transparency as they don’t want people to witness the process. Cheap processed food is detrimental to our health. It’s incredibly addictive, wreaking people’s health. But many people feel they can’t afford other options. I wish the Oprah Show had mentioned other less expensive alternatives like Trader Joe’s, local farmers markets, co-ops or even natural food sections in most grocery stores. Pollan raises the point that many people don’t think you can have a great meal without meat. 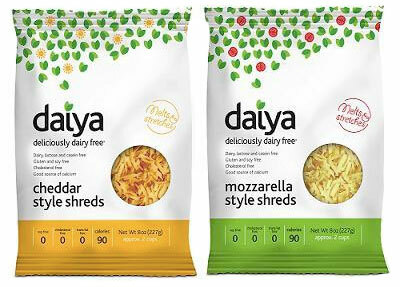 Trust me, as a mega foodie, you can eat incredibly delish vegan food! Freston recommends meat alternatives like Gardein, Boca and Field Roast; dairy alternatives like Vegenaise mayo (love it), Daiya cheese (love it more!!) 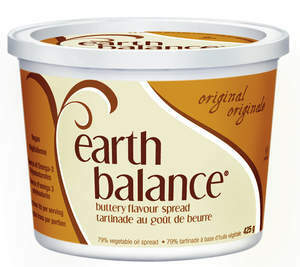 and Earth Balance non-dairy butter (couldn’t live without it!! ); and milks like almond, rice and soy. These staples certainly help people transition into a vegan diet. But you don’t have to eat them. Personally, I’m not a huge fan of mock meats. I’d much rather eat whole grains, veggies and fruits. I have to say that I’ve eaten a wider variety of foods as a vegan than I ever did when I ate meat. And you don’t have to alter your diet completely. You can “lean into it” as Freston advocates. She also talks about how her husband is “veganish;” he doesn’t eat any meat or animal products at home but he eats meat and dairy in restaurants. We do need to reform the system. But this is faulty logic because you don’t have to be killing animals to be a farmer; you could be farming grains, fruits or vegetables instead. This is the same fractured logic employed by those reticent to convert to eco-green technology. Pollan also worries about people becoming vegan and increasing their diet with processed foods like mock meats in lieu of whole food. While meat alternatives like Gardein and Boca can be tasty, they should be eaten in moderation. While Pollan thinks we should eat much less meat, he doesn’t espouse a vegan lifestyle. He says “there’s nothing evil about meat.” Freston agrees stating that for her, the right decision is not to eat meat. People should absolutely choose what’s right for them; no one has the right to tell someone what they should ingest. Having said that, while I certainly don’t find people who eat meat evil, I can’t shake the feeling that meat is murder. Oprah chimed in that slaughterhouses don’t make animals suffer. Oh Oprah, that’s soooo not true. Then Freston brought up the great point that Temple Grandin didn’t design slaughterhouses for birds. “Over 9 of the 10 billion animals that are killed are chickens and turkeys. So it’s different.” Birds are treated incredibly cruelly; being crammed into warehouses and having their beaks seared off. I couldn’t have said it better myself. I personally couldn’t continue to justify eating animals when so many other options existed. Every time I ate meat, I felt guilty. For me, going vegan was the compassionate choice. But I also believe that everyone does what they can. Whether it’s through eating vegan/vegetarian, cooking meat-free on Meatless Mondays or buying organic produce, we each do our part. So after a week-long vegan diet, how did Oprah and her staff do?? All together, some people lost a total of 444 pounds, other people gained weight (84 pounds total) and 8 people quit the challenge. Some people couldn’t get wait to return to their diets of hamburgers and scrambled eggs. But several people wanted to stay vegan for another week, month or indefinitely. And all of the staffers interviewed said that the challenge forever changed their lives, making them more conscientious consumers. Oprah and her producers decided to implement a vegan entrée in the Harpo (her production company) café and Meatless Mondays. And of course Oprah obsessively talked about how people were “pooping more.” Yes, your bathroom habits will change (gross but true!) but she seriously asked people about their bowel movements about 10 times. Oprah has officially become the poop patrol. This episode was a great introduction to a vegan lifestyle. The industrialization of food devastates the environment, animals, factory workers and consumers; basically every living creature on the planet. Eating vegan can make you feel healthier and is kinder to animals and the environment. If Oprah makes people rethink their food and where it comes from, if it makes people make healthier choices, then it succeeded. You truly can impact the food industry by voting with your wallet at restaurants and grocery stores and eating better foods. And Oprah, Freston and Pollan are right. You don’t have to overhaul your entire lifestyle; you can ease or “lean” into it. Just a few changes and several substitutions really can make a world of difference. So how about going vegan for a week?? Would love to hear your results if you take the vegan challenge! !